Below you will find a list of all the Extreme Casino bonuses - offered to new players. The right side offers a casino overview (click to scroll through the images). 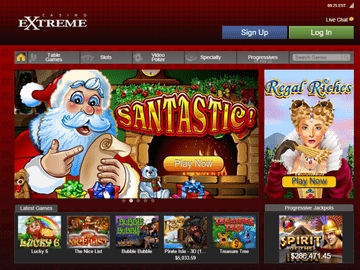 Casino Extreme launched back in 2000 and runs on Realtime Gaming software. It is operated by Anden Online N.V and is licensed by Curacao eGaming. The casino is available in no download instant play using their flash casino, a full download casino, and a mobile gaming options. They are also the first RTG casino to allow Bitcoin deposits and withdrawals. They offer plenty of great bonuses and promotions for players from Canada too. During a recent interview with the brand manager we were delighted to hear that the Casino is committed to giving players from Canada a great experience. They are adding French to their casino software and have a number of players from some of the largest cities including Toronto, Ontario, Montreal, Quebec, Vancouver, and British Columbia. The Casino Extreme bonus for new players from Canada is a 100% first deposit bonus up to $200. The bonus code for this offer is CPBHB and in order to avail of it players must make a minimum deposit of $20. The wagering requirements are quite low at just 25x but baccarat, craps, pontoon, blackjack, roulette, and sic bo are excluded from the wagering requirements. Players can also get a 200% Extreme UpayCard bonus on their first UpayCard deposit at the casino. The bonus code for this offer is UPAY200 and the minimum deposit amount is $20. There are wagering requirements attached to this offer and these are 50x. Again the games listed above are excluded along with the addition of progressive jackpot titles. Extreme Casino also offer a 20% cash back on every deposit you make without a bonus or promotions. This means it you lose you will receive 20% cashback to the value of your lost deposit the following day. Players who wager on Blackjack or 21 games only receive 10% cashback. There are no wagering requirements attached to this. CasinoExtreme also offers a wide range of promotions for regular players and these include deposit bonuses, instant withdrawals, weekly free spins and more. There is also a multi-tier VIP program where players earn points for all wages they place. Unfortunately they don't have a no deposit offer at present but this could be something they will add in the future. Extreme Casino is powered by Realtime Gaming (RTG) software and is one of the best RTG casinos around. They are also the first RTG gambling site to accept Bitcoin. The software is available in download, no download instant play flash, and mobile. The mobile casino is compatible with all devices including iPhone, iPad, and Android smartphones and tablets. The games are all fully optimized and will adjust to suit your screen size. Swipe and tap features have also been built in giving players full control in the palm of their hands. The software is available in English and French and offers a large selection of games for Canadian players. The selection of games includes slots, table games, and video poker titles. Players can enjoy over 100 games for fun or real money and there is also an instant play preview of the titles that can be enjoyed in their browser. Slots make up the majority of the games and they have all been alphabetically categorized to make it easier to find that ones you want to play. There is also a review available for each game too. Popular titles include Aladdins Wishes, Aztec Millions, Hidden Riches, Jazz Time, and more. There are over twenty different table games available including a number of blackjack and roulette variants as well as Red Dog, Perfect Pairs, and Match Play 21. There are over fifteen video poker titles including Aces and Eights, Deuces Wild, Joker Poker, Double Bonus poker, and more. In the other games category players can enjoy Keno, Sic Bo, Lucky 8's, and Hot Dice. There are plenty of slots tournaments too and players can compete against thousands of other casino Extreme players for the chance to win thousands of dollars. There are monthly, weekly, and daily tournaments and all the details can be found on the casino website. When it comes to managing your casino account, there are plenty of options available. All transactions are carried out in US dollars or Euro and Canadian dollars are not one of the accepted currencies. Bitcoin can be used for deposits and withdrawals. Other deposit methods include Neteller, Upaycard, Skrill, EcoPayz, Visa, and Wire Transfer. Unfortunately Instadebit and eCheck are not available for Canadian players but any of the eWallets will work just as well. One of the great things about this online gambling site is that they offer instant withdrawals on winnings when deposits are made using Bitcoin, Neteller, Skill, or EcoPayz. Customer support is available 24/7 via live chat, email, and toll free telephone in Canada. There is also an extensive help and FAQs section where you will find that answers to the most common questions players have. Support is available in English and French and the team are very helpful. The casino website uses SSL encryption to ensure that all player data is kept safe and secure and the software is evaluated and certified by Technical Systems Testing North America Inc. The casino website is very easy to navigate and signing up for an account is very easy. 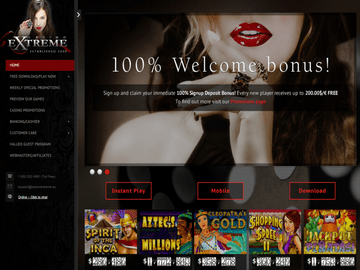 There is plenty of information on the website too and the Casino Extreme bonus of 100% up to $200 was great. The wagering requirements were low at just 25x and there were plenty of games to choose from. The games load quickly on all operating systems and the gameplay is smooth on both PC and mobile. There are plenty of free spins to be had so be sure to sign up for the weekly newsletter and keep an eye on your inbox. You are required to fill in a bonus code for the promotion you are redeeming but again this is very easy to do. Even without a no deposit bonus, we highly recommend Casino Extreme to Canadian players.